Located at Girivan in Mulshi, 45km from Pune and 135 kilometres from Mumbai, Dhepe Wada is one-of-a-kind heritage homestay designed to experience the 350-year-old Maharashtrian wada culture, in all its elegance and glory. Experience traditional Maharashtrian culture in its truest form at Dhepe Wada. The homestay is an hour and a half drive away from Pune via Sus Road. From Mumbai, the place is three-hour drive away via Mumbai-Bangalore Highway. The best part about Dhepa Wada is that its design does absolute justice to the century-old wadas across the state. Besides, it is the only new structure, built in the last 200 years, that is based on authentic Maratha architecture. Brainchild of Nitin and Rucha Dhepe, this wada is a melting pot of Maharashtrian culture. As you reach the place, you are immediately welcomed by the hosts at the Mahadwar or the grand main door. Simple yet royal, Dhepe Wada stands talls amidst the picturesque backdrop of the Sahyadris and vast green lands. The homestay houses 11 rooms that overlooks a beautiful landscape. Each room boasts of antique wooden doors, arched windows, teak-wood furniture and glass lanterns. The main hall is known as Diwankhana, adorns seven massive wooden columns and a carved roof resplendent with intricate architectural designs. There is a five-fold square or a chowk that is specially designed for playing traditional games such zimma, fugdi, mangalagauri, khamb- khamb khamboli and more. Keeping true to the culture, the kitchen has a chulha, wood-burning kitchen stove, a jate, an erstwhile mixer-grinder and a ukhal, an old way of churning out butter using a rumbler. For all your water supply, there is a well! There is an open theatre arena inside the property for occasional plays and musical performances. In the afternoons, read handpicked classics in Marathi and English literature inside the wada library. There are two packages at Dhepe Wada. Parvani is a day tour from either 9.00 am to 4.00 pm or 2.30 pm to 9.00 pm, including breakfast, lunch, tea and dinner. Prices start at INR 975. Anubhuti is the 23 hours stay inside the wada, that includes all buffet meals throughout the day. For a single occupancy room, the price is INR 4,000 per person. For double occupancy, the charges are INR 5,200 per person. You can also get yourself photographed in traditional Maharastrian attire for extra charges! For more details on booking and reservation, click here. 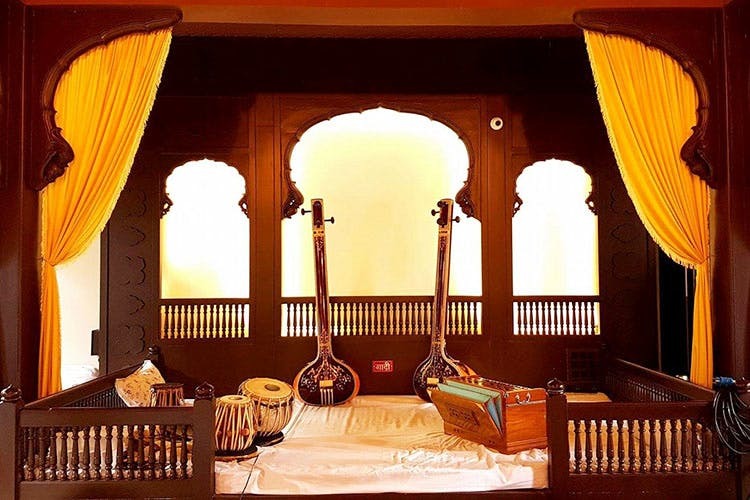 Experience Maharastrian culture and tradition at its very best at Dhepe Wada. Besides, the place is very quiet and calm, just what you need for an ultimate weekend break!